Many parents and grandparents have happy childhood memories of swinging from an old tire hung from the tree in their backyard. Most of us want to recreate that sense of fun for our kids today and start looking for the best way to provide some safe and secure outdoor play time. Of course, you could build the same thing you once had but most people start looking at the more modern idea of a backyard swingset. That may well be how you’ve ended up here, looking for information on one of the most popular models around today, the Flexible Flyer Backyard Flyer II. If so, you’re in luck as we’ve taken a close look at this model to see just what it has to offer and provide you with all the details you need to decide if it’s right for you. We’ve also scoured all the online reviews we can find to see how well it performs in actual use. You will find all you need to know right here so get reading! 1 What accessories are included on the Flexible Flyer Backyard Flyer II? 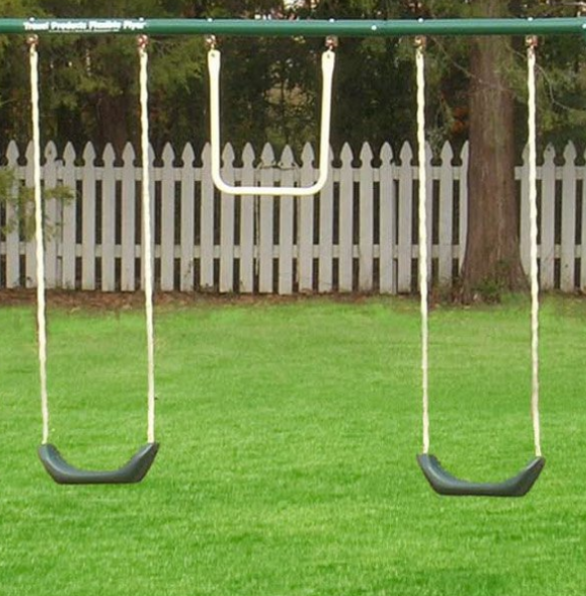 2 What are the dimensions of the Backyard Flyer II Swing Set? 3 Where can the Flyer II be set up? 4 What is the age range for kids that can use the FF Backyard Flyer II? 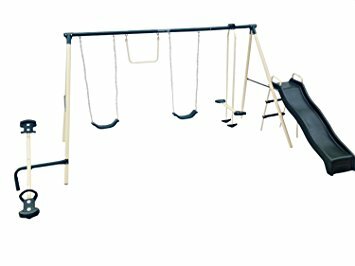 5 What do I need to assemble this Flexible Flyer Swing Set? 6 Where can I purchase the Backyard Flyer II? 7 What’s in the box? 8 Does the Backyard Flyer II need anchoring to the ground? 9 What else do I need to know about this swing set? What accessories are included on the Flexible Flyer Backyard Flyer II? 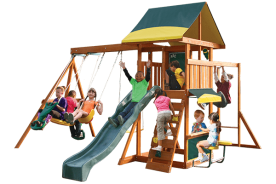 The Flyer II provides everything to turn your yard into a playground kids will love and all at a more reasonable price than you might think. The heavy duty tubular steel frame is powder-coated for durability in an ivory color for the legs and dark green for the top bar. These colors are used throughout on all the accessories for a pleasing coordinated look. All the painted and plastic parts are treated with a UV protectant to prevent them fading over time in the bright afternoon sun. 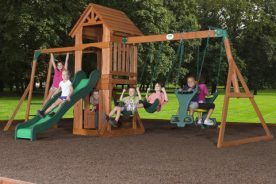 Capable of handling up to eight kids playing on it at a time, this swing set will provide hours of fun for your 2 to 10 year olds and their friends. What’s more is that this set is made in the USA! A robust 2-person see-saw sits on an extension bolted to one side of the main frame. The main seat bar is made from tubular steel in the ivory color whilst the seats are injection molded plastic in the same green as the top bar. Both seats have grab handles for extra support. Hanging at one end of the main frame you will find a 2-person air glider. The frame for this is ivory colored metal tubing whilst the footrests and seats are green molded plastic. Two swings come with this set, one next to the air glider and one at the other end with a trapeze swing in the middle. The swing seats are a comfortable and durable green molded plastic that are easy to climb on and off. The height adjustable chains are vinyl covered for safety and durability. In between the swings is a tubular metal trapeze swing for those tall enough to grab and hang from. The metal is again powder coated, this time in ivory. Finally, at the other end from the see-saw, is a fun six-foot wave slide that sits to the side of the frame, although bolted onto it. The slide itself is the same color green plastic used throughout, with ivory metal frame steps and green plastic treads. What are the dimensions of the Backyard Flyer II Swing Set? With all those features, it should come as no surprise this swing set needs a fair bit of room to be used safely. The actual footprint of the set itself is 12′ 11″ long by 10′ 10″ wide with an overall height of 6′. The manufacturer recommends that you need at least 6′ all the way round for a safe playing area. 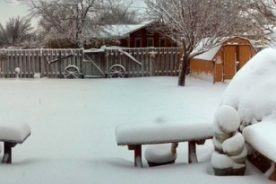 That would mean you need a site measuring approximately 19′ x 17′ to use this safely in your backyard. The shipping box that this set comes in is 87″ x 17.5″ x 10.5″ and weighs approximately 100 lbs, so make sure you have two people around to carry it if needed. Where can the Flyer II be set up? We already covered the space needed for this swingset above, but you might be wondering what sort of ground it can be placed on. Most people will probably end up putting this on a grassy area and not think twice about it. However, if you’re safety conscious you may want to provide an area with a proper safety surface. This doesn’t have to be expensive, something as simple as wood chips or shredded rubber is fine. There is lots of information provided in the user manual that comes with the swingset about what depths and how big the area needs to be. You can find the manual online here if you want to get the site ready before the set arrives. What you must not do is set this up on an area with a hard surface such as concrete or gravel. Children can get serious head injuries falling onto hard surfaces from play equipment so please note this. What is the age range for kids that can use the FF Backyard Flyer II? The swingset is graded for children aged between 2 and 10 years old with a maximum weight of 105 pounds each. As the gym set can have up to 8 kids on it at a time, that means the maximum combined weight is 840 lbs. This also gives us weight ratings for the individual accessories with the swings, trapeze, and slide capable of taking a child of 105 lbs. each. The see-saw and air glider would be capable of taking a combined weight of 210 lbs. but this needs to be evenly split on each side. We have noticed from our research that some reviewers recommend this playset more for younger children than the 7 to 10-year-old age group. It seems they think it is probably not robust enough to handle older children, although there have been no reports of any problems as such that we can find. What do I need to assemble this Flexible Flyer Swing Set? As with many things in life, putting this gym set together is going to be easier if there are two of you doing it. It is possible to do it single-handed but may take more time. On average, most people manage to put this together in 2 to 4 hours. We found some reviewers had trouble putting the set together, but having checked the instructions, that’s surprising. We found the assembly instructions very clear and they even have links to videos to help you along. If you read through these beforehand to get an idea, you will definitely save yourself some time and hassle. If you find you are missing any parts when you come to put this together, then Flexible Flyer has a customer assistance hotline you can call. Check in the instruction manual at the bottom of the ‘Important: Please read these instructions before assembly’ section which can be found on the first few pages. Where can I purchase the Backyard Flyer II? Flexible Flyer sells their products through a variety of retailers including ToysRus, Walmart, Target, and Amazon. Prices vary according to the season but you should expect to pick up this set for between $200 and $250. With such a wide range of retailers, you will find that this play equipment can be purchased both online or from a local store. Given the size and weight of the swing set, we do recommend though that you find somewhere that will ship it to you, preferably for free. We think that Amazon is one of the best places for this and you can find their current price for the Backyard Flyer II by visiting them periodically. Besides all the parts for the swing set and bolting everything together, you will also find the two tools we mentioned, an alignment rod and an Allen wrench in the box. There are also 4 ground anchors provided to secure the legs and some warning decals which should be stuck on where indicated in the manual. The warranty on this model is for 180 days from the date of purchase and covers defects in materials, workmanship and also rust on any painted parts. Note this is not surface rust but anything that compromises the structural strength of the swingset. Does the Backyard Flyer II need anchoring to the ground? 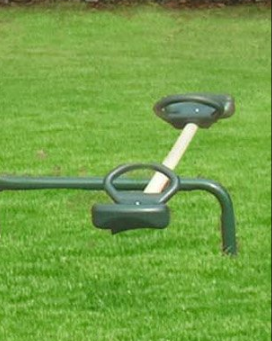 As we mentioned above, there are 4 ground anchors supplied with the swingset and it’s a good idea to make sure you install these. They stop the legs from moving when children are playing on the swings etc. 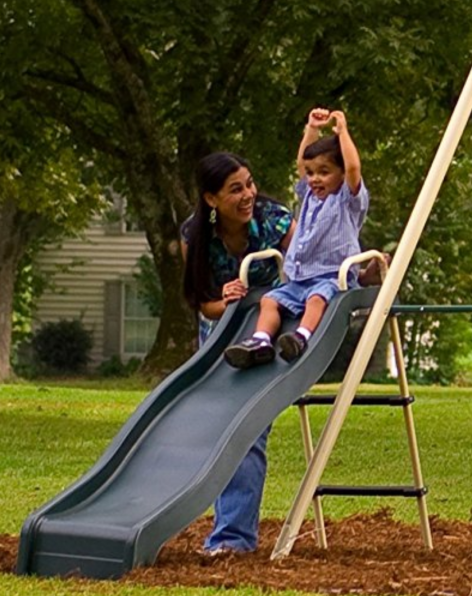 which is common with all these types of play equipment. Some reviewers found these were not enough to stop the set moving in their situation and so you may need to find some heavier duty anchors or make your own. Flexible Flyer has a set they sell which will fit this model and you can find it on Amazon as well as the other retailers we have mentioned. What else do I need to know about this swing set? We’ve found some interesting feedback from reviewers and mentioned many already in the related areas. Probably the main one to address is that a handful of reviewers questioned if this swingset was really suitable for older kids. It’s always best to check that your children fall within the maximum weight limit of course and to make sure there are not too many playing on it at a time. If there was a real problem we feel, then Flexible Flyer would not be able to sell these for the ages/weights they recommend. 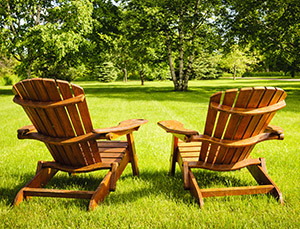 The company has been around since the 1880s and has a good reputation for supplying high-quality swing sets which is always good to know. They also have an easily accessible customer service department for any problems should you be unlucky enough to have any. Finally, remember to read and follow the instructions in the user manual provided. There is one section in there with crucial information that many people forget. This is the section titled ‘Maintenance Instructions’ and if you follow this, chances are you will prevent many of the problems people have complained about. This is a great piece of American made play equipment that should provide your youngsters with hours of fun and just as importantly, exercise. It’s priced very competitively and with all the activities it provides, there’s plenty to recommend it. Just make sure to follow the tips and recommendations in our article and your kids will have their own private playground in the backyard for many years to come.